The above graph shows the top ten wards affected by the bedroom tax according to Leeds City Council. This also makes a (not too strict) list of target areas in terms of having stalls, holding meetings and getting people organised. 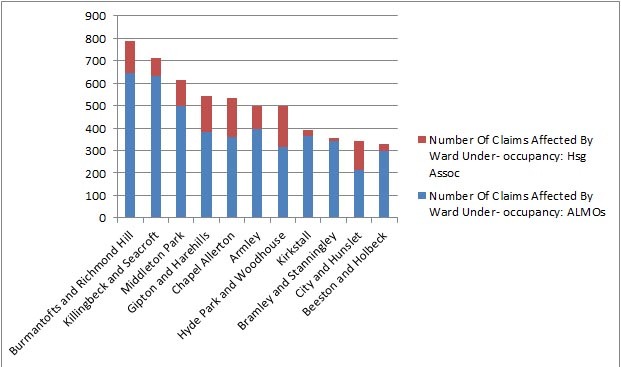 Of course it is more complicated; wards are huge places and in cannot necessarily be treated as one area, heavily effected areas are not equally spread across the ward, and the name of the ward does not always represent the area we would guess at (Chapel Allerton includes bits of Harehills and Chapletown for instance). However it does give a rough idea where we should be aiming at, and a freedom of information request in at the council should help narrow it down further.